What are your thoughts on mixing prints, have you been brave enough to try it? What do you think of the outfit? love this. i saw this outfit via a room somewhere and fell in love. you did a great job at finding pieces that echo the original outfit. only thing i wonder about is the size of the prints. 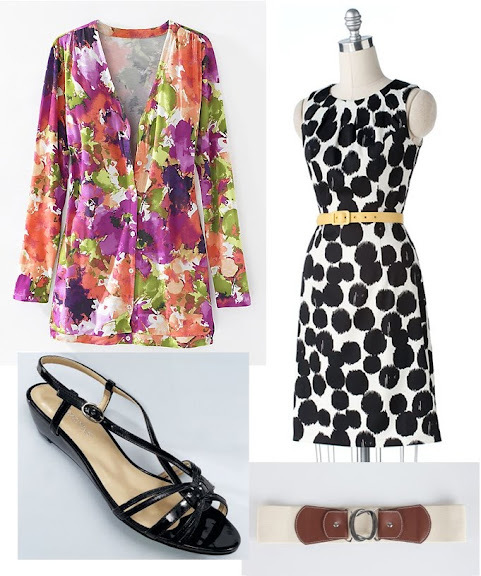 in the anthro look it's small dots with larger floral. your look has the same feel, but i wonder if the two prints are to large? love the deal on the kohls dress. I wear polka dot shoes with a striped skirt, and I think it totally works. You just need to find a combo you like. I wish I could pull off Minnie Driver's mixed florals in "Return to Me," but I just haven't found the right prints yet. I love the mix but I think I'm too scared to try it. Maybe two prints that are a little more subtle. I was totally going to do this same post. so funny. Good job. Heather J - I saw it on a room somewhere too. Heidi Jo - You are right, my dress is much more bold in pattern. I couldn't find on that was as subtle + and I really like the Kohl's sheath, even if I wouldn't wear it with that sweater. Love the look! I need to mix prints more. I loved that outfit as well. Nice picks to recreate it.